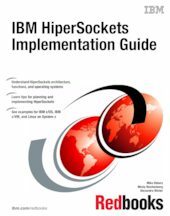 This IBM® Redbooks® publication provides information about the IBM System z® HiperSockets™ function. It offers a broad description of the architecture, functions, and operating systems support. This publication will help you plan and implement HiperSockets. It provides information about the definitions needed to configure HiperSockets for the supported operating systems. This book is intended for system programmers, network planners, and systems engineers who want to plan and install HiperSockets. A solid background in network and Transmission Control Protocol/Internet Protocol (TCP/IP) is assumed.